We take a visit to Co Down, Northern Ireland, and see how agriculture and engineering have gone hand in hand in the development of farm machinery through the years in this remarkable collection. History shows how agriculture and engineering have gone hand in hand in the development of farm machinery. For many farmers natural engineering skills allowed them to design, build and modify basic machinery which was available to them at the time, resulting in improved farming practices, increased crop production, the better use of manpower and the ability to make something from virtually nothing. Ronnie Deering from Co Down, Northern Ireland, was born into a farming family but he also possesses the natural engineering abilities which allow him to appreciate the ingenuity, hard work and perseverance of those early pioneers of agricultural engineering. "My father moved his family to this farm in Co Down from Co Monaghan in 1943, so while farming is naturally in my blood I have always had an interest in anything mechanical," explained Ronnie. "The first machines I began to collect and restore were stationary engines. As well as having a genuine interest in their construction and how they work, one other good reason to collect them was that they were readily available in this area." A natural progression to collecting and restoring tractors was inevitable according to Ronnie who said that his first tractor project was a 1949 Case LA which he restored and has kept for some 25 years. Other tractor acquisitions and restorations followed until the decision was taken to look for the more unusual, individual and, some would say, challenging machines to work on and enjoy. And after some research his interest was attracted by Lanz, a company with a long proud history of innovative engineering. A family affair - right to left Ronnie Deering with his wife Margaret and grandson Ross. Built in Germany, Lanz tractors were sold world-wide; such was the quality and design that companies from as far afield as Australia round the globe to South America and back to Germany copied the Lanz design with much success. "The first Lanz tractor I bought was a 1937 hot bulb single-cylinder 35hp Model N which was in quite a sorry state. The tin work was in a very bad condition and the tyres were completely rotten; it certainly looked a challenging restoration project," Ronnie said. "I stripped the tractor down and went through everything from nose to tail, checking, repairing and replacing components where necessary. Various mechanical parts and tin work I had to make myself as I could find no replacement parts. After all mechanical and tin work repairs had been carried out I even painted it myself, not superbly I would say, but to a reasonably good standard; practice makes perfect! "The single-cylinder tractors built by Lanz were probably not as refined as some of the other machines which were available from other manufacturers at the time but they were extremely well engineered and built with high-quality materials. The single-cylinder engines were designed to run on practically any type of fuel including coconut oil as well as waste oil and were very economical as the combustion process lasted for a longer period of time, which resulted in a longer flow of energy." However, these basic single-cylinder engines were very powerful, producing considerable torque and Ronnie says that his Model N could still probably beat many a modern tractor today on a tractor pull. Such was the success and respect for these early Lanz tractors that several companies built Lanz tractors under licence, including Landini, Orsi, SF Vierzon and HSCS, while other companies, such as the Polish Ursus, Argentinian El Pampa and Australian KL (Kelly & Lewis), simply built copies. Marshalls of Gainsborough even acquired a Lanz, which was stripped down and assessed. 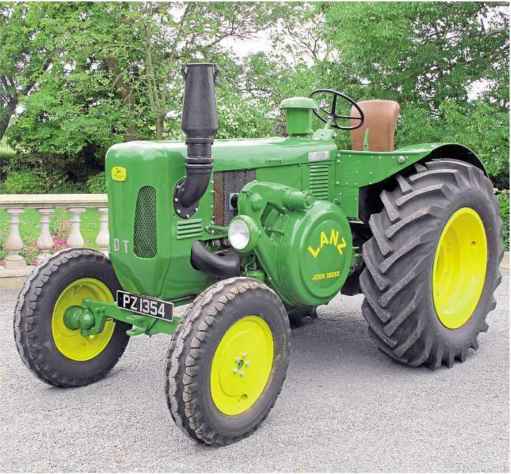 The resulting Marshall tractor differed mainly to the Lanz in that it was powered by a true diesel engine. Long retired from an agricultural working life, the Model N is now displayed at local tractor and agricultural shows and takes part in tractor road runs. "Although my second son David enjoys driving the tractor at events such as Mount Stewart (now Rosemount), he says that it is a hassle to actually start as the steering wheel has to be removed and inserted through a hole in the flywheel; then the blowlamp is lit and the hot bulb heated. The engine is then rocked backwards and forwards via the steering wheel," Ronnie said. "I have heard it said that in Australia, some Lanz operators would sometimes leave their tractors running all night to save the trouble of having to re-start them in the morning." As the engine on the Lanz can run both forwards and backwards when initially started, or can change direction when left running at very low revs, the Lanz engineers designed and fitted a pointer to the dashboard to indicate engine direction to the driver. Ronnie said: "Despite the economy and reliability of the Lanz, working in the field on the Model N all day would have been very tiring for the operator because the single-cylinder machine shakes constantly. Many farmers would have eagerly welcomed the more refined tractors which later became available." The Lanz Model N is a single-cylinder hot bulb tractor rated at 35hp. The John Deere Lanz D6516 DT was rated at 65hp and remained in production for a short while after the introduction of the smaller horsepowered 'New Generation of Power Series' of tractors. The roomy operator platform of the D6516 is well laid out and easy to work from. The D6516 features a PTO shaft, continental hitch and an adjustable height draw bar. As with the Lanz Model N, on starting, the engine will run either backwards or forwards. However the D6516 is fitted with a pendulum starter which mimics the action of the Model N where the steering wheel is manually rocked back and forward by the operator. Also on top of the coil an additional component throws a constant stream of sparks to the spark plug, very similar to a trembler coil which would have been fitted to a Fordson Model F tractor or Ford Model T car. Ronnie says that compared to the blue Lanz, this tractor has a smoother, more balanced engine which reduces the rocking action considerably. It also features a more highly developed exhaust system with a shorter stack which incorporates a large chamber where gasses are allowed to explode. A cup is situated at the bottom of the exhaust chamber to catch any excess, unburned lubricating oil. The engine oil is recycled to the engine by a pump fitted to the bottom of the crankcase. The engine is started on a petrol/diesel mix then changed over to diesel when warm. An on/off switch is located on the dashboard to switch from the petrol to the diesel tank but Ronnie says that it is important to remember to switch back to petrol early when stopping the engine to avoid having to bleed the whole fuel system; it can take up to five minutes to get the petrol running freely through the fuel system again. "This tractor has a real presence, and as far as I am aware," said Ronnie, "it is the only example of this particular model in Ireland. Improved comfort in the form of a sprung seat meant that operators could work a longer day. Sometimes two operators would be employed to drive, when one was tired, another would simply take over. "I have tried to restore this tractor to as near original condition as possible, but one more job I have to do is to make a side seat to fit on the fender, as would have been fitted to the tractor when new." 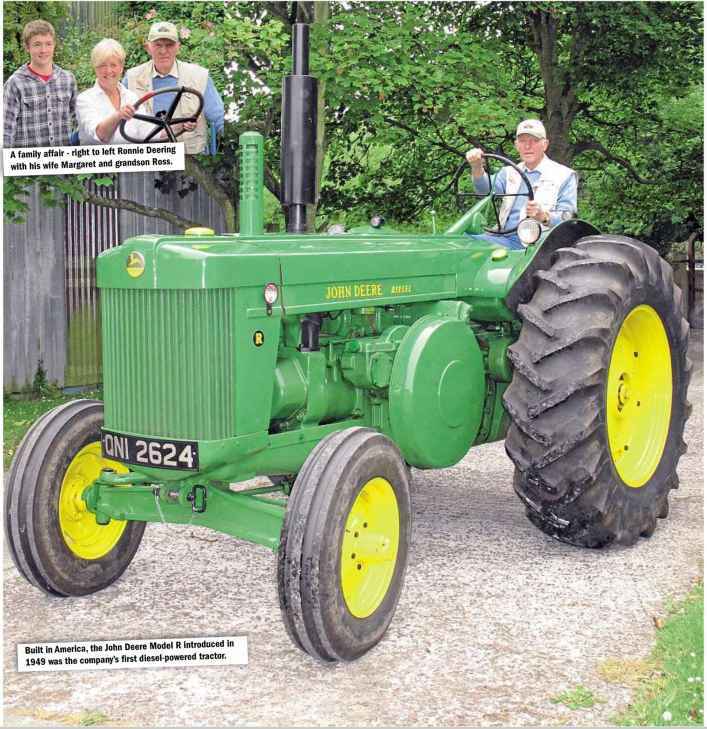 The search began to trace a green and yellow tractor and after some considerable time Ronnie heard of a suitable tractor, a very early 1960s John Deere Lanz D6516 DT, and contacted the owner who sent a picture describing the machine as complete and in good running order. "I bought the tractor on sight of the picture," said Ronnie, "but when it arrived, sadly its condition was far from as had been described and shown in the photographs. A complete nut and bolt restoration began to return the Lanz to its original condition." The powerful single-cylinder engine is rated at 65hp but over the years the rocking motion of the tractor when running had caused the wheel centres to fail so the previous owner had fabricated replacement centres. After a difficult search, fortunately new rims were sourced from a supplier in Holland. "One unusual feature of this particular tractor indicated by the DT designation on the front cowl is that it has creeper gears," Ronnie explained. "I don't really know why they would be required on this model unless it was used for row crop work, but it is rather a big, chunky machine for that type of work. It also has a differential lock, PTO shaft, continental hitch and an adjustable height draw bar. No power steering is available but it is quite a manoeuvrable machine once on the move, and the new front tyres, which i am told were sourced from Russia, seemed to help considerably." As John Deere tractors already formed part of the collection on the Deering farm and with the importance to the agricultural world of the acquisition of the majority of Lanz shares by John Deere in 1956, Ronnie felt that a John Deere Lanz tractor would represent the relationship between the two companies well. "While visiting a tractor event in Australia I noticed a restored John Deere Lanz for sale for which the owner was asking more than I could afford. I had decided that if I was going to buy a second Lanz, then it had to be a John Deere Lanz to follow the progression of the two companies. As I was not in a position to spend such a sum of money then, I decided to try and find another tractor which was in need of restoration," he said. "For many years, the John Deere Company in America had insisted that the only satisfactory engine for agricultural use was the two-cylinder petrol kerosene unit," said Ronnie. "However this theory changed in 1949 with the introduction of the Model R powered by a two-cylinder diesel unit which was started by a two-cylinder horizontally opposed petrol donkey engine," Ronnie said. "It is not possible to adjust the speed of the donkey engine so it just runs at full revs, but as the exhaust passes through the inlet of the main engine it only takes a very short time to warm the main engine to facilitate starting." The John Deere R, built in 1949, was in a very bad state of repair when it arrived in Northern Ireland. Ronnie thinks that the tractor had probably been lifted by a crane or Hiab at some time with one chain around the bonnet and belly and another around the mudguards. He added: "There was a lot of tin work damage due, I believe, to bad handling, which often occurs when people think that they are just moving scrap material. It can be handled carelessly and damaged, which then results in extra, unnecessary and sometimes difficult repair work for the enthusiast." Inspection revealed that at some time the tractor was probably half of a tandem unit before being retuned and restored as a conventional tractor. After a complete restoration the Model R was used to pull a combine, a task it struggled to achieve. "I had given the engine a complete overhaul, fitting new main bearings, but the tractor felt completely gutless when I tried to move the combine," Ronnie said. "So it was back to the workshop to try to rectify this lack of power. "I carried out fuel delivery tests to the injectors only to discover that there was next to no fuel reaching one of the injectors. 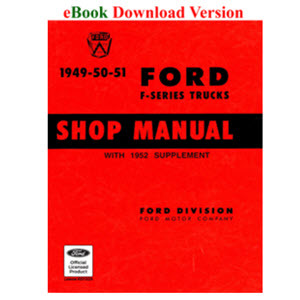 The fuel system has two separate injector pumps and although the handbook advises against altering the fuel delivery to the injectors, I decided to check them over. I was able to balance the delivery of both injector pumps and the tractor has had plenty of pulling power ever since." According to the State of Nebraska test result No 406, the John Deere Model R was the most powerful JD tractor to date rated at 34.27 at the drawbar and 43.2 at the belt. The engine on the Model R was started by a two-cylinder petrol-driven donkey engine which started the main two-cylinder diesel engine. Ronnie's grandson Ross is a valuable assistant with the family's tractors aboard the diesel-powered John Deere Model R.
The driver's eye view from the seat of the JD Model R.
The whole principle of starting the tractor is rather interesting, requiring a three-handed style to operate a decompression lever and engaging a lever on the dashboard as well as operating the starter button. Once up and running the tractor is a fine machine to drive and in spite of being heavy it is very frugal with diesel and will achieve in the region of llmph on the road. There is no suspension on the driver's seat, but once the engine is running at slightly higher revs, the ride is a comfortable one. Ronnie said that the Model R is much nicer to drive than the Lanz Model N. "I can just sit on the seat and press buttons to start it, not like the N which can take up to 10 minutes to start. Also if you don't get the sequence of events quite right on the Model N, the hot bulb becomes charged with fuel, which then has to be cleared. If the engine starts with excess fuel in the bulb, the engine may over-rev as the governors cannot reduce fuel already in the bulb combustion chamber," he explained. "If I were to compare driving the Lanz Model N with the John Deere Model R, then I would say it would be like going from a Ford Prefect to an Austin Cambridge." The Deering collection reflects the progress from the use of single-cylinder hot bulb and twin-cylinder petrol kerosene to the two-cylinder diesel and on to the six-cylinder engines with the latter being represented by a 1969 John Deere 4020 Classic rated at 96hp. 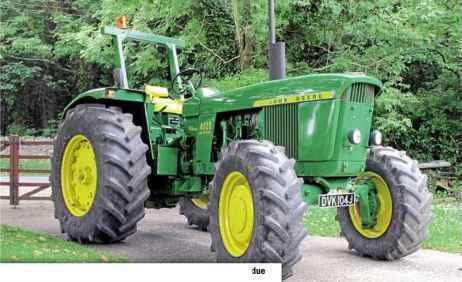 It is believed that this particular tractor was produced in America but assembled in John Deere's facility in Mannheim as there are several features which would not have been seen on 4020 models brought into the country from the USA. One easily identifiable difference is the exhaust, which is oval in shape. 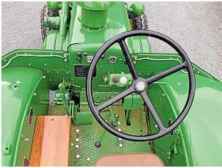 Also, the mudguards used on the American-built tractors were wide at the front and tapered to the back, whereas those on Ronnie's machine are straight and come lower down over the rear wheels. A handbrake is situated on the right-hand side of the flat deck floor and drum brakes are fitted on the inside of the rear wheels. The actual foot brake system is a transmission brake, which is very effective. If the tractor should lose engine power, foot brake power is also lost, but a cylinder containing liquid nitrogen is situated behind the dashboard which can be used to retain assisted braking pressure for a short time. The transmission is a Powershift system with eight forward and four reverse gears, which Ronnie said is a tremendous advancement from the ordinary clutch and gear stick system. At the bottom of the gear selection column is a park position which acts as a transmission lock. He added: "However, when the tractor is parked on a slope and the transmission lock disengaged, there is a tendency for the tractor to roll downhill, so this is possibly why the handbrake has been fitted. "The Powershift is really efficient when pulling a heavy load and it also features an inching clutch which is invaluable when manoeuvring slowly to couple up to attachments." Lighting on the 4020 is also very distinctive with two small headlights fitted to the front of the tractor. "I had never seen lights like this before, but fortunately I was able to find both lenses and reflectors to replace damaged parts," Ronnie explained. 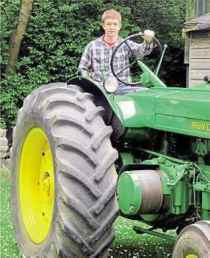 "Another distinctive feature is the roll bar which is a genuine John Deere component and was already fitted on the tractor when it arrived with me." As can occur with big six-cylinder engines, when starting in very cold weather the 12-volt system sometimes requires a little assistance, so there is a facility on the dashboard to attach a container of an 'easy start' type fluid which is sprayed down a pipe then fired into the manifold. "The engine will then start immediately," said Ronnie, "but I would stress that this is a John Deere recommendation, not mine." Hydraulic front wheel assist gives this big tractor an impressive turning circle, Ronnie says it can be turned in virtually the same space taken by a Ferguson TE-20. This is one of the great advantages the system has over mechanical front wheel assist which requires a greater turning circle, resulting in greater headland turns. 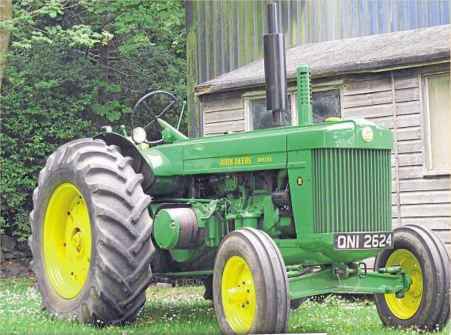 The turbocharged JD 4020 tractor was the most popular of its time i to its design being ahead of Its time. When the 4020 was originally tested at Nebraska, test No 849, It was rated at 91.17hp at the drawbar. 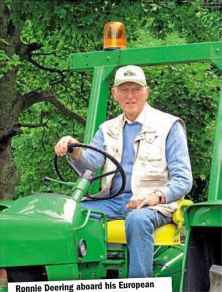 Ronnie Deering aboard his European specification John Deere 4020 Classic. The hydraulic front wheel drive has a three-position switch to select off, high power or low power, which is located on the dashboard. However, the system is not governed to the rear wheels, which can create problems when travelling downhill, especially on grass fields, as the front wheels want to keep pulling, causing the rear wheels to lose traction; there is no 'hold back' as with mechanical front wheel drive and the tractor can actually run away on hilly fields. 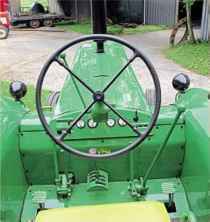 The John Deere Lanz connection has been quite complex over the years; many enthusiasts collect either Lanz tractors or John Deere tractors, while others may only collect American-built machines. 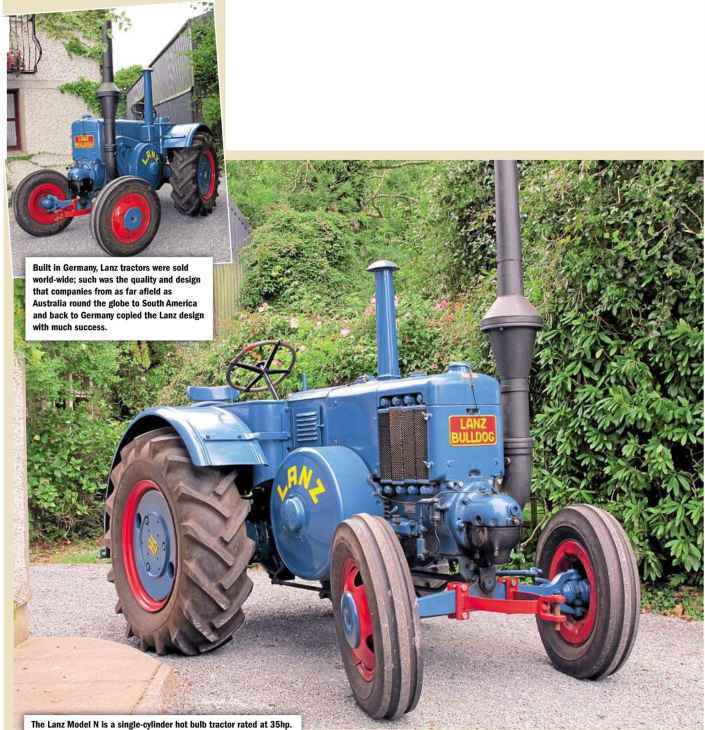 To find in one collection a mix of quality restored machines which can tell the full story is a rarity indeed, clearly showing the advancement of tractor production in two different countries some 5000 plus miles apart. How to use a rejvenation progression cyender? 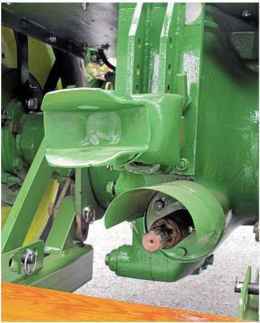 Where to find transmission pump on 4020?